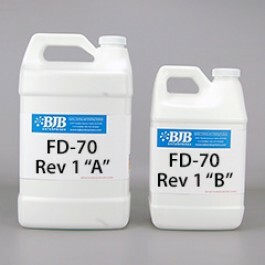 BJB’s FD Series of semi rigid, fast reacting urethane elastomers exhibit great flexibility and excellent durability. These tough, abrasion resistant systems easily process at room temperature and range in hardness from 50 Shore D to 70 Shore D. The FD Series offers superior performance in many applications such as rollers, foundry tooling and high impact semi rigid parts. For longer work times consider BJB’s MD Series of elastomers.